Traditional Bavarian folk costumes 1840. 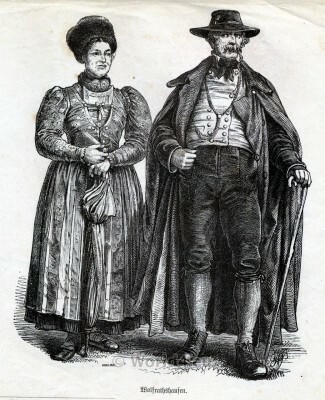 Man and Woman from Schliersee, Bavaria 1840. 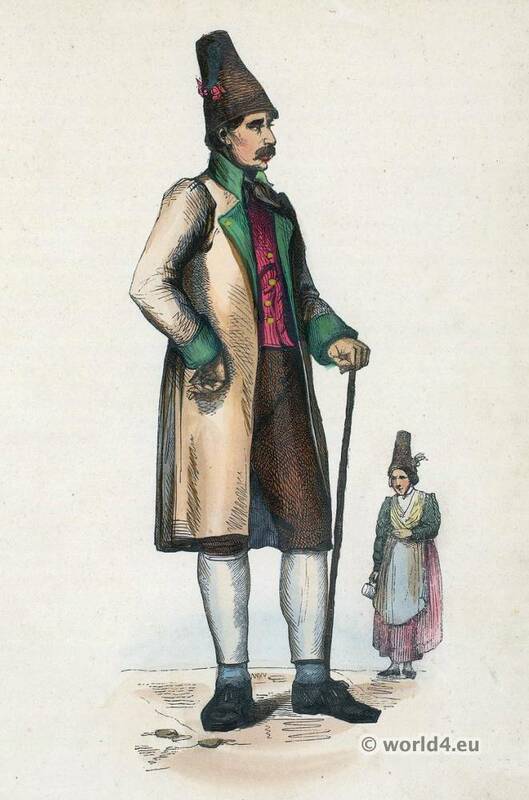 Man and Woman from Schliersee, Bavaria 1840. Homme et Femme du Schliersee. Bavière. Gallery: Manners, customs and costumes of all peoples of the world, based on authentic documents and and newer travel by Auguste Wahlen. This entry was posted in 19th Century, Germany, Traditional and tagged Traditional Bavarian costumes on 7/7/14 by world4. Raftsmen costume from Bad Tölz Bavaria. Raftsmen costume from Bad Tölz Bavaria, 1860. Gallery: Folk dresses from Norway, Dutch, Germany and Hungaria. This entry was posted in 1860, 19th Century, Germany, Traditional and tagged Traditional Bavarian costumes on 1/27/14 by world4. 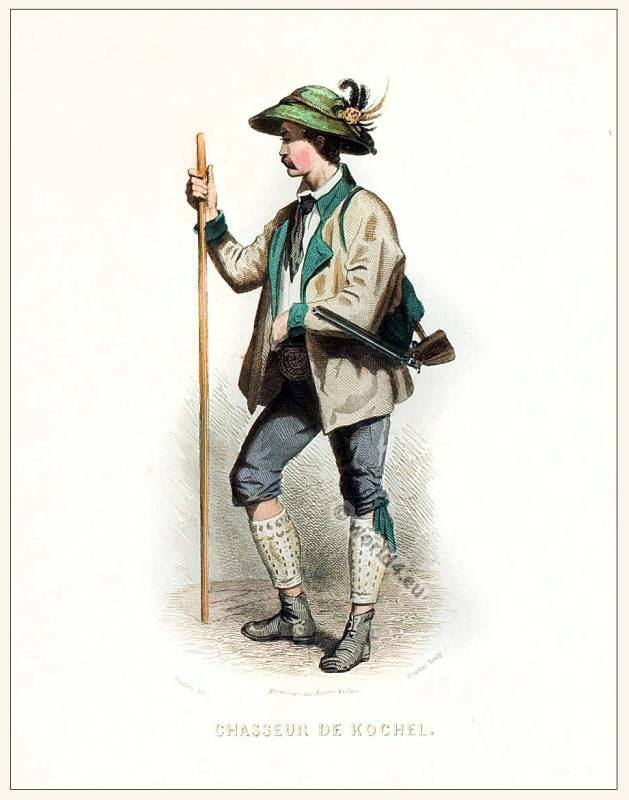 Bavarian Huntsman costume from Kochel, 1860. 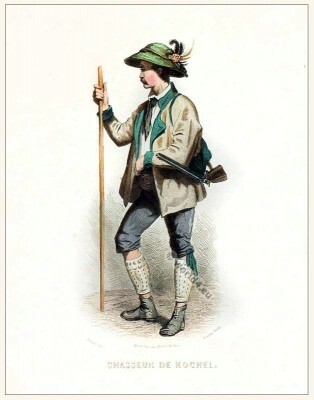 Allemagne Nº5 (Baviére) Chasseur de Kochel. This entry was posted in 1860, 19th Century, Germany, Traditional and tagged Traditional Bavarian costumes on 1/26/14 by world4. 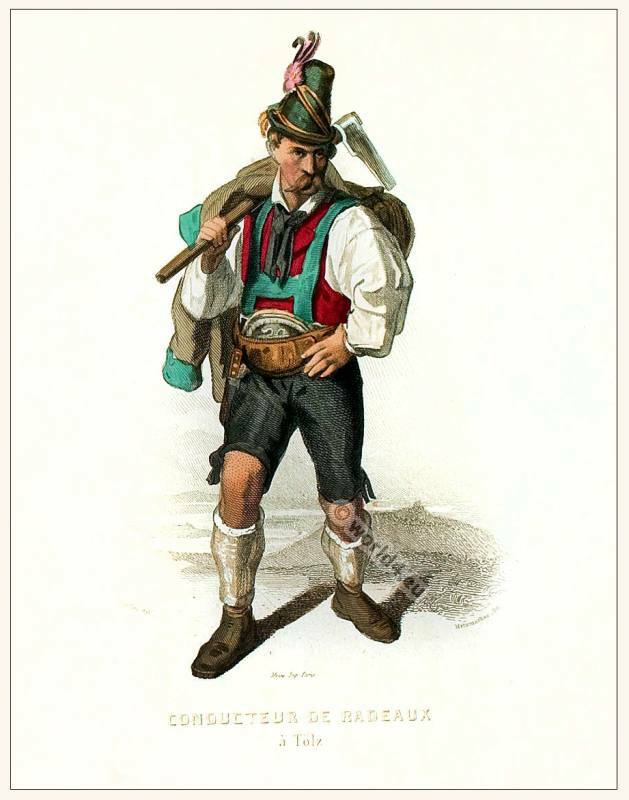 Bavarian traditional costume from Göppingen, 1860. This entry was posted in 1860, 19th Century, Germany, Traditional and tagged Traditional Bavarian costumes on 1/25/14 by world4. 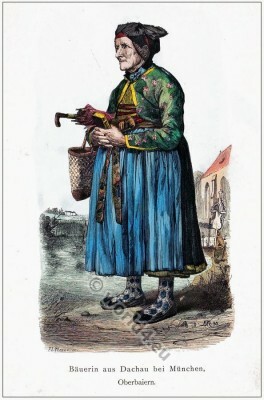 Peasant in traditional Bavarian costume from Dachau, 1860. This entry was posted in 1860, 19th Century, Germany, Traditional and tagged Traditional Bavarian costumes, Traditional German Costumes on 1/24/14 by world4. Bavarian folk dress from Aichach. Girl in Bavarian folk dress from Aichach near Munich. Traditional South German costume. 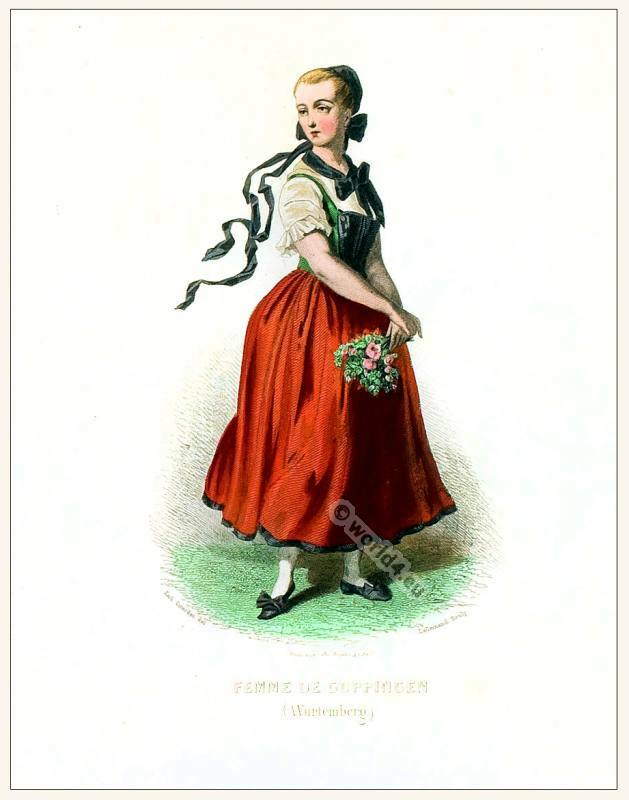 Original Dirndl design c. 1820. Blätter für Kostümkunde. Historische und Volkstrachten. Published by Franz Lipperheide, Berlin 1876. This entry was posted in 1821, 19th Century, Germany, Headdresses, Traditional and tagged Lipperheide, Traditional Bavarian costumes on 6/1/13 by world4. Traditional Bavarian clothing. 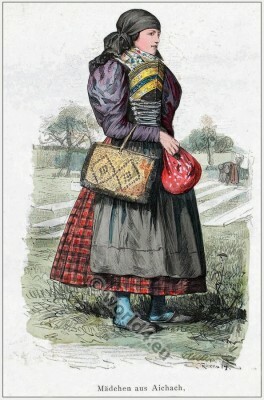 Farmer woman 19th century. An old Peasant woman from Dachau near Munich on the way back from church. In hand she holds a prayer book, an umbrella and a handbag. These are the basic equipment of a farmer’s wife for sunday church, just a few years ago. The dress, original called “The Dirndl” is the original design during the period around 1850. That festive costume was worn only for special occasions. The apron in intense blue color. 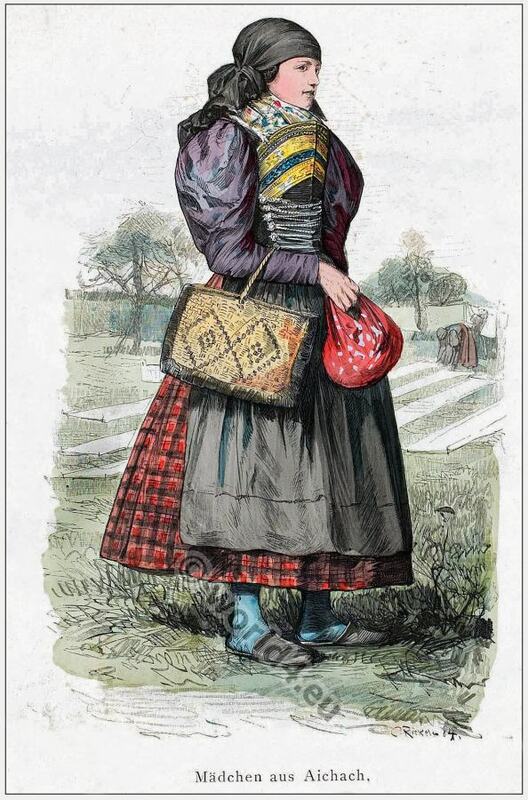 This entry was posted in 1850, 19th Century, Germany, Traditional and tagged Lipperheide, Traditional Bavarian costumes on 5/31/13 by world4. Children`s country costumes. Traditional bavarian clothing. Children`s country costumes. Traditional bavarian clothing, 1920s. Vintage Postcard. 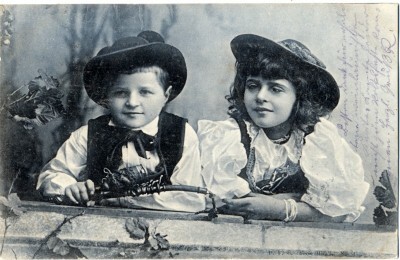 Girl and boy with big hat in beautiful traditional children’s costumes from Bavaria. This entry was posted in 20th Century, 30s, Child, Germany, Hat, Traditional and tagged Children Costumes, Traditional Bavarian costumes on 5/3/13 by world4. Traditional Bavarian folk costumes from Starnberg, Munich. 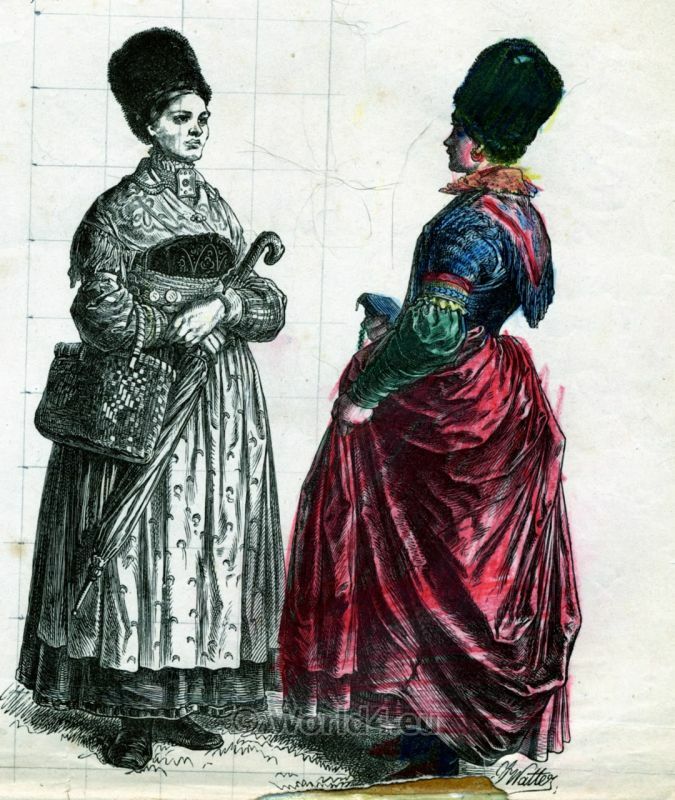 Costumes from around Starnberg from the years 1850s. Starnberg is a lake of the same name and place south of Munich in the district of Upper Bavaria. This entry was posted in 1860, 19th Century, Germany, Hat, Traditional and tagged Traditional Bavarian costumes on 4/22/13 by world4. Traditional Bavarian dresses from Starnberg in 1850. Traditional Bavarian dresses from Starnberg. 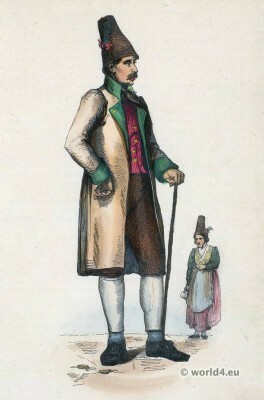 Male costumes from around Starnberg from the years around 1850. Starnberg is a lake of the same name and place south of Munich in the district of Upper Bavaria. The men in high boots, wide-brimmed hat, watch chain, long coat, baggy pants and vest. To a scarf is worn. A stick completes the appearance. This entry was posted in 1860, 19th Century, Germany, Hat, Traditional and tagged Münchener Bilderbogen, Traditional Bavarian costumes on 4/22/13 by world4. Traditional Bavarian Costumes from Wolfratshausen, 1860. Traditional Bavarian Costumes from Wolfratshausen, 1860, 19tes century. Old Bavarian festive dresses. Man and woman in original “Trachten” (Bavarian dialect for folk costumes) of Wolfratshausen near Munich, Bavaria, Germany. 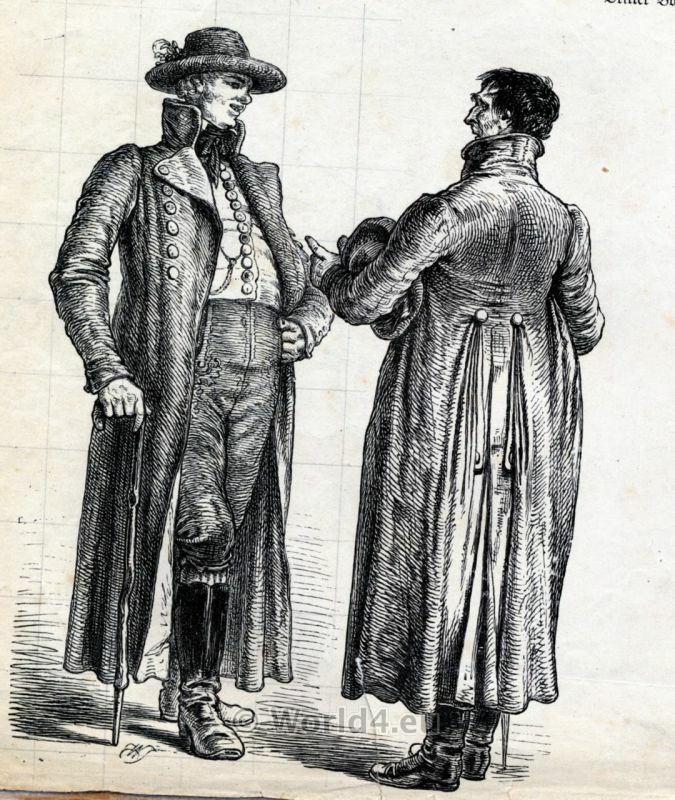 The man with leather pants (Original made ​​from deerskin and never washed), a big hat, walking stick, long coat pocket along with watch chain, to a double-row jacket and a scarf. The woman a strikingly high fur hat. A one-piece with dirndl skirt, petticoat, blouse and a striking necklace. 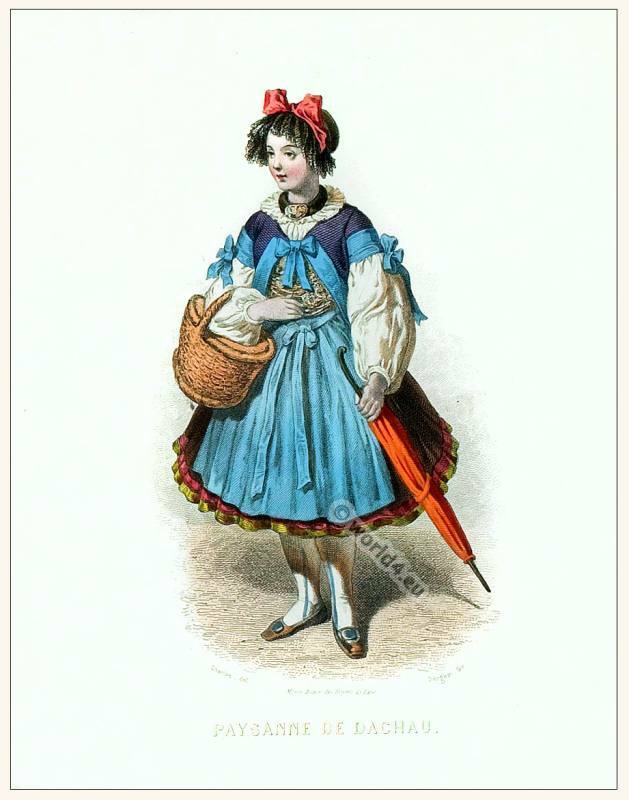 In her hand she holds an umbrella or parasol. This entry was posted in 1860, 19th Century, Germany, Hat, Traditional and tagged Münchener Bilderbogen, Traditional Bavarian costumes on 4/21/13 by world4.